When the weather is cold, my hands need mittens. Whipping those mittens on and off to get at some spare change, use my transit pass, turn a page, or fiddle with my coat zipper can be awkward, especially when my hands are already full. Gloves are more convenient, but they aren’t as warm. These fingerless mitts with a removable mitten enclosure not only keep my hands and fingers warm as toast, but when I need my fingertips to be free, I can do that without removing the entire mitt. Since I anticipate that the mitten top will be in use the majority of the time, I designed it to lie flat when it’s off. There’s no i-cord loop or button to get snagged on anything. These gloves also accommodate my larger-than-average fingers by increasing slightly from the wrist to the knuckles. The measurements contained in this pattern are simply a guide. 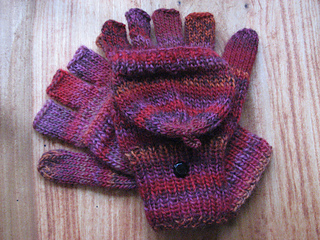 The good thing about knitting your own gloves is that you can (and should!) customize them for your own hands.